The headlines are in red lettering with a sub-heading under it in black. There is a "representative" photo (more on THAT in a minute) that takes up the center of the card. At the bottom, in two column layout, the details of the hi-lite. 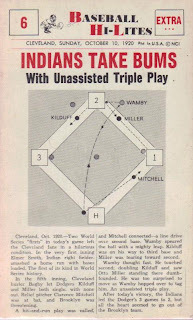 The card features a write-up about Early Wynn crushing the Yankees in the 1954 season to keep them out of the pennant. The place on the paper reads "Cleveland." 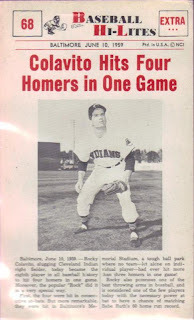 Early Wynn did play for the Indians in 1954. So, what's the problem? The picture is actually from Wynn's team AT THE TIME THE CARDS WERE MADE! 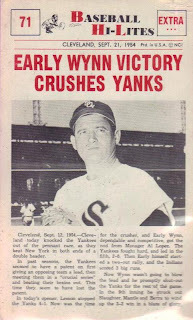 You see, Wynn played for the White Sox in 1960, hence the "wrong" picture for the featured event! Wait a minute! Doesn't that remind you of a recent set in which the photo on the card may or may not have had anything to do with the event on the card!? Wow, talk about going vintage! 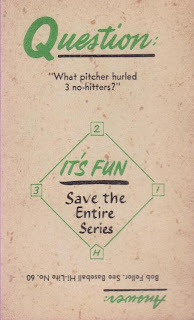 On a more positive note, the back of each card features a trivia question. Unlike later sets that did this and made you hunt down the card with the answer, these cards actually give the answer and then refer you to the card that has more info! How nice of them. 63 Warren Spahn Beats Yanks in W. S.